Are times changing for head covering women (or men)? The modesty or reverence of a head covering is still firmly attached, and the criticisms by those who don't feel the need or desire to cover their heads are still opined almost daily. People are still coming to conclusions and/or realizations about those head coverings. Politics and culture is still a big part of wearing a piece of cloth on one's head. As has been pointed out for many things, "the more things change, the more they stay the same." Men and women show their faith and devotion by covering their heads, or even their hair. Some women and men show their fashion style. Some people work in the sun or an environment where they need to protect their head. Head coverings are used as a symbol or identification with a group. And many people have a personal, natural desire to cover a head that was previously covered by hair with a hat, scarf or other covering. Other folks don't see the need for additional covering to hair, despite having reasons pointed out to them. They sometimes make fun of those who do. They sometimes bully those who do. Sometimes, not understanding others, they assign their own divisive meanings to that piece of cloth, and may even develop a fear or hate of the person who covers, and make rules and laws that compels others to go against their beliefs, morals, or comfort, simply to appease those who cannot or will not try to understand. Education will always be needed, as it always has. Some will listen and learn. Some my even adopt the practice themselves. And some will not care, as long as they don't have to change themselves. Others will not listen, and ignorance will bring about harm to others. As it has always been. Keep learning. Keep sharing what you learn with others. Uncover the light. But let others cover their heads - sometimes that simple act can itself shine a light. Times Changing for Saudi Headcovering? Head covering Muslim in Minnesota beauty pageant. NaturallyCurly.com has posted some beautiful head wrap photos from National Head Wrap day, November 20. State of Georgia, USA, to ban head covering? 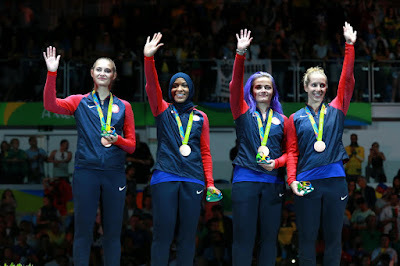 Most in the head covering world who follow the current Olympics probably have noticed this lovely athlete who just won an Olympic medal while wearing a head covering. As an American citizen. You go, girl! Ibtihaj Mohammad - the first US athlete to compete at the Olympics wearing a hijab has won a bronze medal. Muhammad competed with Dagmara Wozniak, Mariel Zagunis and Monica Aksamit to defeat the Italian team 45-30. "Muslim female athletes find sport so essential they compete while covered"
"The campaign against enforced hijab in Iran has seen women defying morality police in public and even shaving their hair. Now men are also joining the fight." Wearing a headscarf is strictly enforced by so-called 'morality police' in Iran and has been since the Islamic Revolution in 1979. Women who do not wear a hijab or are deemed to be wearing 'bad hijab' by having some of their hair showing face punishments ranging from fines to imprisonment. State-funded adverts appearing on billboards in Iran present those who do not cover their hair as spoiled and dishonourable. Women are also told that by not complying, they are putting themselves at risk of unwanted sexual advances from men. But women are leading protests against enforced hijab across the country and some have resorted to shaving their hair in order to appear in public without wearing a veil. Over the last week, a number of men have appeared in photos wearing a hijab with their wife or female relative next to them who have their hair uncovered. 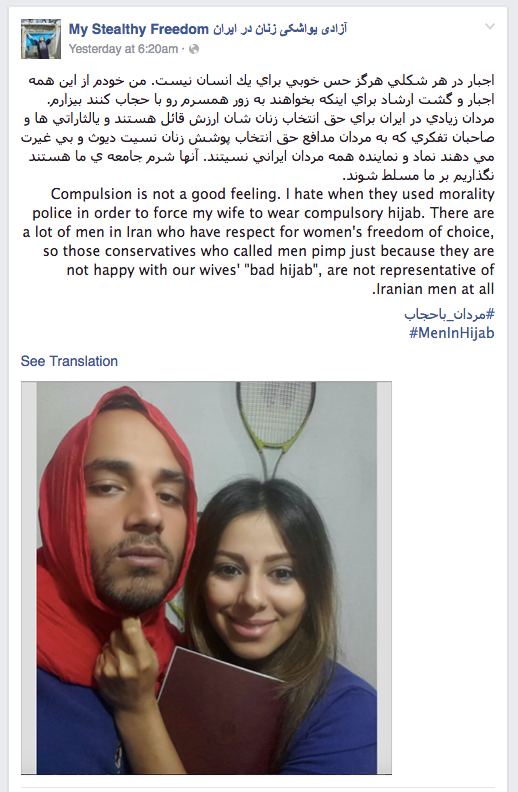 The images come in response to a call by Masih Alinejad, an Iranian activist and journalist living in New York, who is urging men to support her campaign against enforced hijab. "We were trying to look around for branches, and he just sprung to action, took off his turban right away, threw it in the water and pulled her to shore." 'I saw a child down on the ground and a lady was holding him. 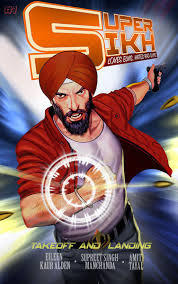 His head was bleeding, so I unveiled my turban and put it under his head,' he said. 'I wasn't thinking about the turban. I was thinking about the accident and I just thought, "He needs something on his head because he's bleeding". That's my job - to help. Two heroic Sikh men have broken religious protocol by removing their turbans to help save four men from drowning. With the help of some bystanders, he managed to climb down the banks of the canal by holding one of his turban, which he used as a rope. NOTE: Among the Sikhs, the Dastaar is an article of faith that represents honour, self-respect, courage, spirituality, and piety. Sikh men and women wear the turban partly to cover their long, uncut hair (kesh). Normally turbans are only removed in the most intimate of circumstances, when bathing the head, or washing the hair. My "Those Headcoverings" blog is a place to gather news and notes as they are posted online, and to share. Inclusion here does not mean that I do or do not agree with all of the teaching or opinion you will find contained in these sites - or that you will agree with all of the others' opinions. "Orthodox Christian Women Vs. Muslim Women"
Is Muslim Hijab a Head Covering?